iPod has been one of the most popular and successful video players. The iPod family has now expended to several generations, including iPod shuffle, iPod mini, iPod classic, iPod nano and iPod touch. As of September 2007, the iPod had sold over 110 million units worldwide making it the most popular digital audio player series. iPod classic, iPod nano and iPod touch can play MPEG-4 (H.264/MPEG-4 AVC) and QuickTime videos. If you want to convert FLV, AVI, MPEG and other types of videos to iPod movies, you can use Kigo Video Converter to achieve the goal. Kigo Video Converter Pro is the versatile iPod movie converter that can convert AVI, MPEG, FLV, RMVB, VOB, MOV and many other video formats to iPod MP4 movies. This iPod movie converter can convert various video formats to iPod movies at fast converting speed and with excellent video quality. We can get iPod videos from the Microsoft iPod Marketplace and other Pay-Per-Download Sites which have movie downloads, music downloads, music video downloads, and more. The problem with downloading iPod files from places like Microsoft iPod Marketplace is the cost. That is to say, it is not the best choice. We all have known that "Both come with a new touchpad-style input device and new software (also available for the iPod 30.) Additional file support for H.264 and MPEG-4 file was also included". And computer users nowadays are likely storing many video clips in their hard disk. However, because of the screen size and the video sources, they may need to convert the videos on computer before importing their clips to this beautiful mobile device. If we want our videos playback for the iPod, we must convert the unfit video files to iPod video files by MP4, H.264 or WMV formats. Kigo Video Converter Pro, as a powerful iPod video converter, can convert video to iPod video, iPod nano, iPod classic, iPod touch on Mac OS X with powerful functions. Kigo Video Converter is an excellent Mac iPod movie converter, it enables you converting all popular audio and video files such as MPEG, AVI, MKV, WMV, MOV, FLV, MP4, 3GP, 3G2, Mpeg TS/TP (for HD Video) to iPod video and audio including MP4, mov, etc. 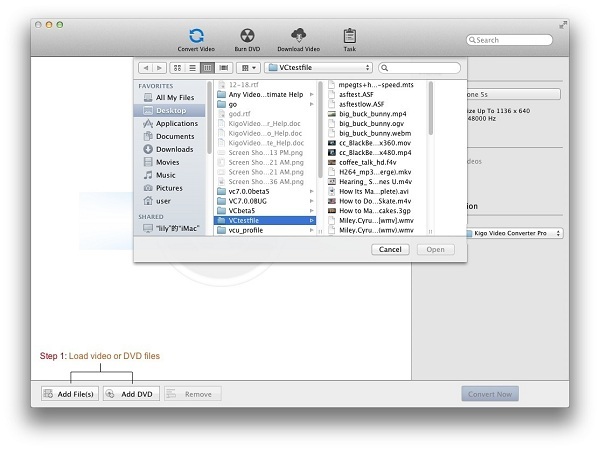 Kigo Video Converter Pro for Mac or Kigo Video Converter Pro for Windows to convert any video for your iPod. This iPod video converter offers an easy way to convert video to iPod movie from most popular video files like AVI, MPEG, WMV, DivX, MP4, H.264/AVC, MPEG-4, MKV, RM, MOV, XviD, RMVB, VOB, and 3GP. Moreover, the iPod Video Converter is able to extract audios from movies or music videos and convert them to iPod MP3, WMA and AAC. The converted videos can be played on many video players like iPod, iPod, iPhone, Apple TV, PSP, PS3, Creative Zen, Archos and iRiver. It is your best iPod movie converter. With this powerful converter, you can convert almost all video formats including DivX, XviD, MOV, rm, rmvb, MPEG, VOB, DVD, WMV, AVI, FLV movie formats to H.264, MP4 ready for your iPod. Click the Add File(s)/ Add DVD button (Also through the menu item File-> Add File(s)/ Add DVD or drag files to the list directly from your disc or other location) to select the files you want to import. Click the required profile in Profile drop list on the main interface including all kinds of video and audio profile. 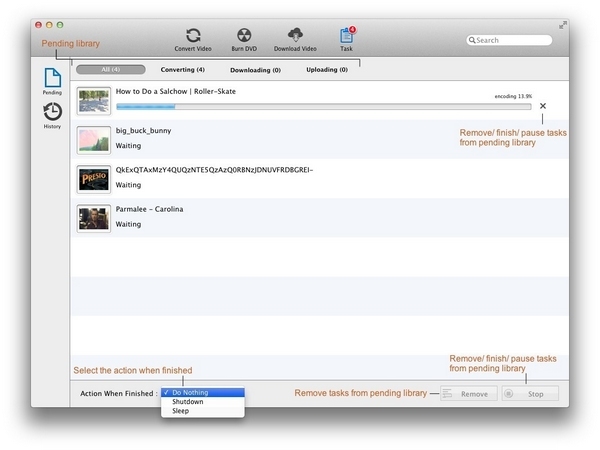 Click the Output Location - Folder drop list and then click Choose… to set the destination. Click the Convert Now button and then list is empty. Meanwhile all of the files on the list are added to the Task - Pending - Converting list starting the conversion in turn and the countdown begins. 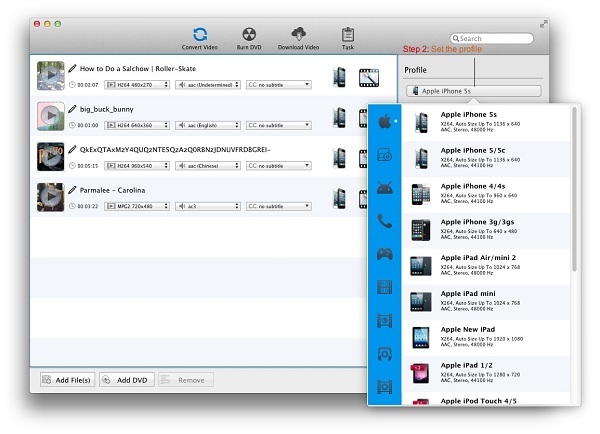 After conversion, you can enjoy the converted files on your iPod with ease.